The cardiostrong exercise bike BX60 features 12 pre-set programmes and also allows the user to create his or her own programmes. Four user profiles offer an effective cardio training for weight loss for the whole family as all family members can access stored data quickly and easily. Here you get to the results of the exercise bike test of the Swiss magazine Kassensturz of January 2015. Read the results of the exercise bike test of January 2015 of the Swiss consumer magazine Kassensturz. Exercise bike with excellent test results! 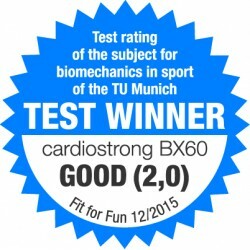 The BX 60 of cardiostrong achieves the second place with 92.18 %. The workmanship of this model is beyond reproach and it is extremely stable; user panel and screen are certainly impressive. The number of training programmes and the resistance levels are great as well. The BX60 offers the best training experience of this group; it is also thanks to the (very) softly padded saddle, which is of a very big size. The cardiostrong exercise bike BX60 features a superb console which is neatly arranged and easy to use thanks to its rotary control knob. There are 19 programmes to choose from, some of which are pre-set, some of which are customised. 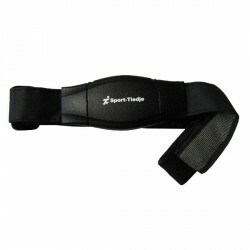 Four users in total can save their profiles on the console of this exercise bike. The display of the console is equipped with a backlight. It's quite comfortable and helpful for adverse lighting conditions or for spectacle wearers. 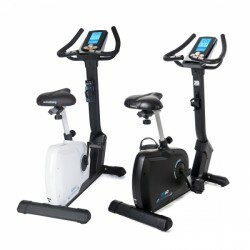 The cardiostrong exercise bike BX60 is not only easy to control but also provides a very comfortable training. The torso of the upright bike has a very low step-through for easy getting on and off. The sitting position is easily adjustable to the height of the user and thus provides perfect training ergonomics. The saddle is well padded and wide. This pays off especially during long cardio training. A 9 kg flywheel makes the concentric run of the resistance very smooth and gentle. Here you get to the results of the exercise bike test of January 2015 of the Swiss consumer magazine Kassensturz. Ich bin total begeistert. 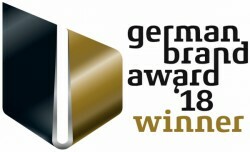 Das Gerät ist wirklich hochwertig. Der Sattel ist bequem und das Gerät ist wirklich leise beim Rundlauf. Ich bin wirklich zufrieden und empfehle das Gerät gerne weiter. Sehr gute Beratung vor Ort! Bequemer Sattel, gute Einstellungsmöglichkeiten! Stabiler Stand! Fitness Equipment care kit In stock! 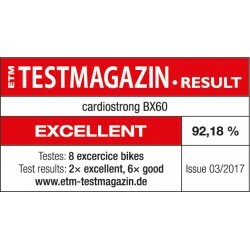 cardiostrong exercise bike BX60 add to comparison list.